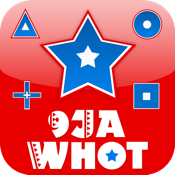 HAVE YOU EVER PLAYED 9JA WHOT? If you have, then you know this is the BEST card game on the planet! The primary purpose of 9JA WHOT is to be the first player to rid of all your cards. Playable cards are cards with the same symbol or number as the previous card played. Game ends and scoring begins when a player successfully gets rid of all their cards. Use General Market, Pick Two, and Hold On to perplex your opponents.